A perfect grab and go breakfast that is wholesome and uses some of your sourdough starter? Yep! These have great texture and flavor. I think you'll love the ingredient list too! We have a new member of the household that I haven't told you much about yet. Her name is Bertha. She came into being a few weeks back and thus far has been a good house guest. She requires a little attention now and then and needs fed at least once a week. The best part is she makes delicious baked goods. Beautiful boules of bread, sandwich loaves and she has even made a delicious batch of pasta. And now she is making muffins! She is so versatile and handy to have around! Of course, she is my sourdough starter. Here is how it happened. I was minding my own business one day. My husband and Little Dude were gone for a bit so I had a little time on my own. So, I did what any reasonable person would do with some spare time... folded laundry! I pulled up Netflix and clicked on an episode of Cooked. It was the air episode, talking about bread. By the time I was done folding the mountain of laundry, I had decided I HAD to have some sourdough. You can order a starter, but that didn't seem good enough. I had to MAKE one of my very own. I know the Old Fat Guy makes a lot with sourdough, so I found his instructions on starting a sourdough baby. He suggested naming your new baby. He says you are more likely to feed and less likely to kill something with a name. So I lovingly incubated and fed my new baby for 5 days before she became Bertha. Maybe some day Bertha can meet his sourdough, Sam. I'm sure they'd hit it off splendidly! So far Bertha has been getting quite a workout and we have been enjoying having her around. She hasn't had much rest, but she also hasn't complained much. She is just happy to be fed and to make delicious creations. She has made some great pizza dough, waffles and sandwich bread. 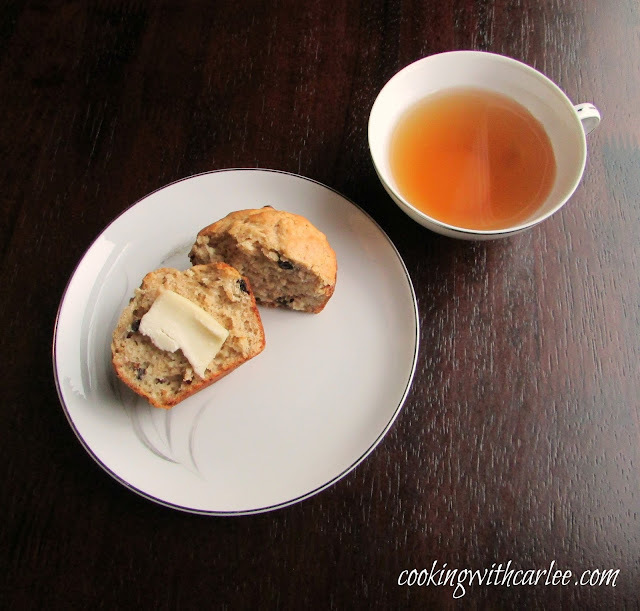 Today I stirred her into some fun and pretty healthy muffins. She had her first taste of brown sugar and she loved it! She bubbled with delight. I also stirred in some yogurt, because if we are going fermented food we might as well go whole hog! 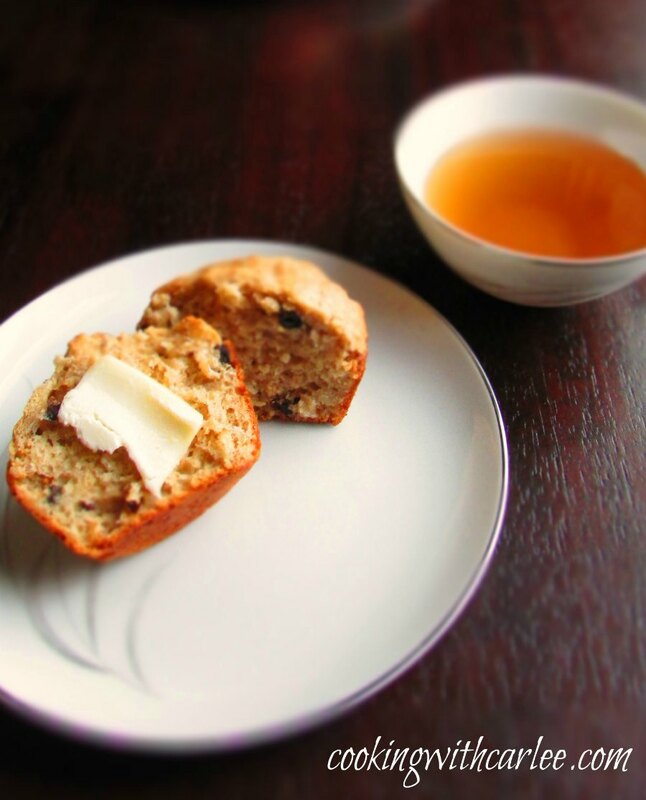 The muffins turned out beautifully and would be a delicious and healthy addition to your morning routine, whether that means grabbing one as you run out the door or sitting down to a leisurely brunch. Either way, enjoy! Stir together oats, milk, yogurt and raisins right away and let sit while you gather up the rest of the ingredients and get ready. 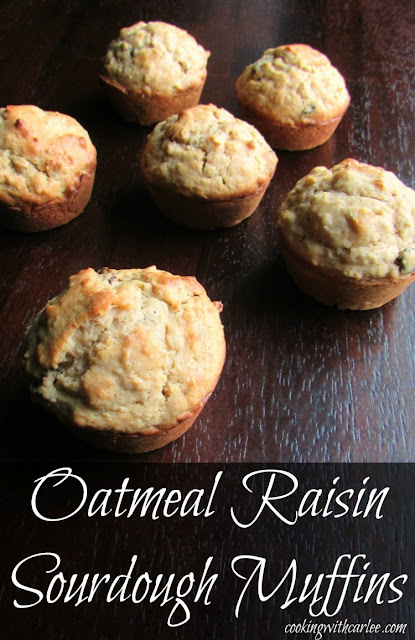 You want the oats and raisins to have a chance to soften up a bit. In a small bowl, mix together flours, baking powder, baking soda, cinnamon, nutmeg and salt. Great roundup Carlee! I can't wait to try Crunchy Pear and Brie Crepes, and the Eggs Purgatory. They look right up my alley :-) Sourdough starter is another thing on my bucket list of things to try, along with Apple Butter. The muffins look yummy! Don't they all look great! I just started my sourdough on a whim. After making my first couple of boules, I wasn't sure if I had made a mistake. But I have been having so much fun playing with it. If you want to go full sourdough, it is time consuming (but delicious) but there are a million fun hybrid recipes out there too. This was a twist on an easy one I found and it could be changed up a million ways. I can't wait to try more! Wow Carlee these muffins look so amazing and I bet are just yummy. They really are good, Julie. 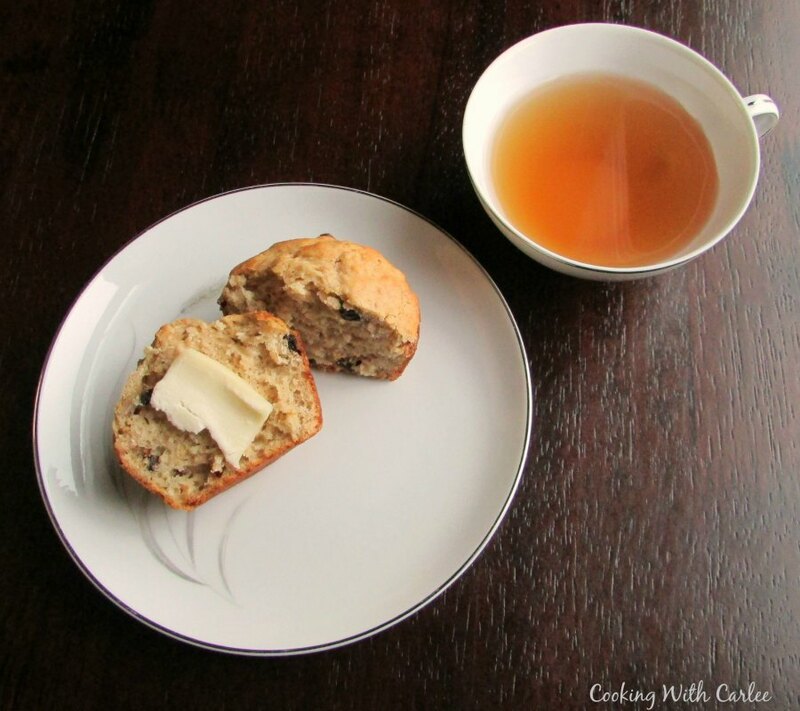 It is interesting how the oatmeal basically melts into the muffin. I hope you have a lovely weekend too! That's great Carlee! Loved hearing about Bertha. So interesting. I think I need to do this! And I'm so excited about Mother's Day Brunch! I have had so much fun playing with her so far. I've only had her a few weeks and so far we have made a couple sourdough boules, 3 loaves of sandwich bread, focaccia, a couple batches of muffins and pizza dough. She has been getting a workout! Breakfast/Brunch is my favorite meal and I don't know how anyone could find a better round up of recipes. Thank you! I love breakfast and brunch food too! I could live off it, I am pretty sure! Congratulations on the birth of Bertha! I love this recipe. If I only had a starter ... You have me motivated. Saying hi from SITS Link up! Thank you! It is a proud day. You can make your own starter, it is only a 5 day gestation! ;-) I have been having so much fun playing with Bertha. You'll have to let me know if you give it a go! Love brunch! Anytime of the day! This post reads like a brunch buffet, one of my most favorite things, ever! I love the story of Bertha! LOL And the name is perfect. She seems to make the most perfect muffins too, these look so delish. And Bertha is the gift that keeps on giving, can't wait to see what you use her for next! Me too and a brunch buffet is one of my most favorite things too. I haven't been to one in far too long. I'm going to have to change that soon! Bertha has been busy. I'll definitely have to share more recipes! Looks wonderful, Carlee! I love the old fat guy, and so funny about the name!! What a great collection of Brunch recipes! Thanks so much for sharing them with us at Full Plate Thursday and come back soon! Thank you! She's like a quiet pet that helps in the kitchen! Hi Carlee, another good reason to get a sour dough starter bubbling! I'm popping over to check out how Sourdough Sam came about! It really is so easy! Just a few days and a bit of flour and water and you'll be in business!